Big Joe in his polo prime. A strong No. 4 who ultimately achieved a 3 goal rating in his 50's. 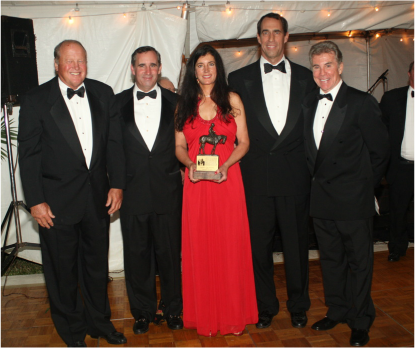 2010 Induction of Big Joe Muldoon into the United States Polo Association Hall of Fame. Steve Orthwein, Charlie, Mary and Joe III with John Walsh. Charlie, Dante, Big Joe and Mary participate in the annual Wedding Cup, Muldoon Family Polo Match. 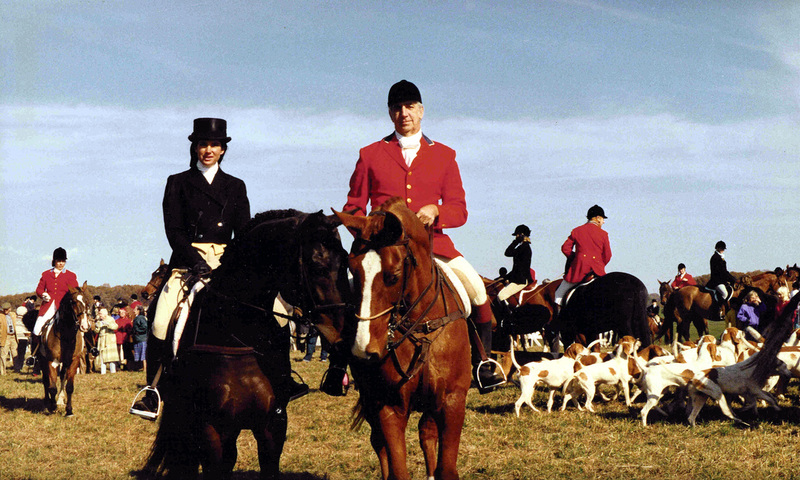 Mary and her father Big Joe at the start of a hunt with the Potomac Hunt, Montgomery County Maryland. The Muldoon family has always been an equestrian-centered family. The patriarch, "Big Joe" Muldoon was an incredibly charismatic and optimistic person who inspired others. While creating the highly respected and successful Washington DC-based law firm of Muldoon & Murphy, he and his wife Caroline raised their children to be equestrians and the family was surrounded by many of the greats in the horse world, from polo and dressage to show jumping and racing. 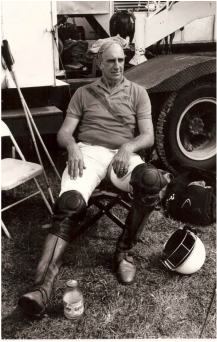 In the 1970's Big Joe took over the Potomac Polo Club from Tommy Dowd, moved it to a new location in Poolesville, Maryland where he eventually constructed nine polo fields. With his home team of Gone Away Farm he collected many prestigious medium and high goal prizes, including five wins of the 20 goal USPA Monty Waterbury Cup, the USPA Association Cup, and the USPA Chairman's Cup among many others. He was especially proud of his first USPA national championship in the 8-goal Association Cup, which was achieved with Big Joe, his daughter Mary, his sons Charles and Joe III. It was also the first time that a father and his progeny had captured a USPA national title. Big Joe also created the International All-Stars Match, the highest rated US polo game for many years and the first time since 1939's Westchester Cup that a 40 goal match had been played on US soil. This fund raiser for therapeutic riding included many of the greatest polo players of the the time and in the history of the sport from around the globe, including Juan Carlos Harriott, Gonzalo and Alfonso Pieres, Eddie Moore, Tommy Wayman, Memo Gracida, and Red Armour. It was one of the hottest tickets in Washington during its heyday in the 1980's. This tradition is continued in the annual 40 goal match held at the International Polo Club in Palm Beach for the benefit of the Polo Players Foundation. 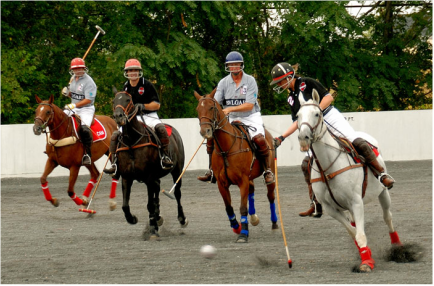 Many foreign players who went on to greatness in polo got their start in the sport in the States as members of Big Joe's team, including Juan Bollini, Gabriel Donoso, and Wicki El Effendi. 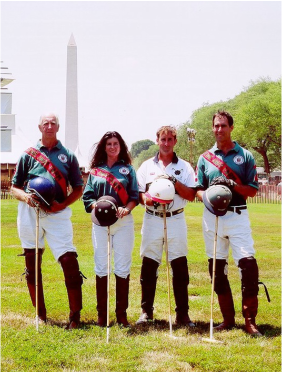 Throughout his lifetime Big Joe aided by sons Charles and Joe III and daughter Mary have raised millions of dollars for various charities through the sport of polo. In the early 1980's Big Joe along with his son Joe were the originators of the Family House Polo Match that has been held annually for over 30 years in Pittsburgh, PA to benefit the Family House organization that provides a special “home away from home” for patients and/or their families who are in Pittsburgh seeking medical treatment. The Muldoon family continues this tradition each year in Pittsburgh, PA.
Today the Muldoon family continues in all aspects of the sport of polo: training polo ponies, fielding winning teams, teaching new players and working in official capacities within the United States Polo Association.